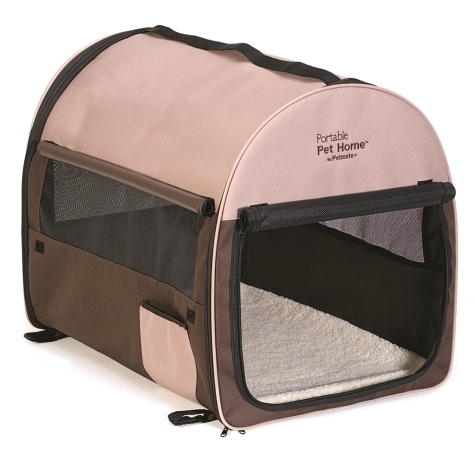 Let your pet feel right at home no matter where you travel with the Petmate ® Portable Pet Home. Easy to carry and easy to set up, this essential traveling companion keeps you and your furry friend happy wherever you end up. It sets up anywhere in seconds and conveniently folds into a carrying case. Made with a heavy-duty outdoor/indoor water resistant fabric Four ground stakes are included to ensure Fido's abode stays put. Features include climate control window covers on all four sides. Storage pockets for all the doggy essentials. Bed covering a comfortable foam pad. Zippered mesh door and upper side vents can be rolled up and held open by hook and loop fasteners. Sized right for any dog.